* The participants in the control group of SDHS were allowed to use high PUFA margarines/oils if they wished, and many did. As such, the control group reported a high intake of PUFA (8.9%). Because the control group in SDHS made some dietary changes, it’s probably more appropriate to look at the participants’ baseline intake of SFA which was 16.4% in the experimental group and 15.9% in the control group. 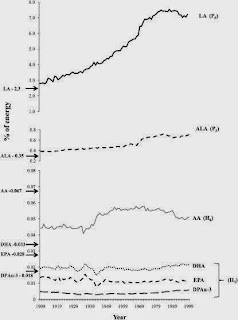 In 1958-1964, the ‘US railroad’ cohort in the Seven Countries Study reported consuming 125.9g of fat (49.6% TC), 55.3g of SFA (21.8% TC) and 582 mg cholesterol , but whether this N of 30 accurately reflects the US average is quite debatable seeing as it’s a much higher figure than the USDA food supply data and the diet heart trials. Here's an Australian study showing declining levels of atherogenic pollutants. It models trends back to 1975, showing a steady decline, but doesn't seem like the last word, seems designed as proof of method for future historical reconstruction. Zeliger HI. Lipophilic chemical exposure as a cause of cardiovascular disease. Interdiscip Toxicol 2013; 6:55–62. And this for BPA - which is the modern, milder version of the old POPs. I had to turn back to this post after looking at the subgroup analysis in Hopper 2015. 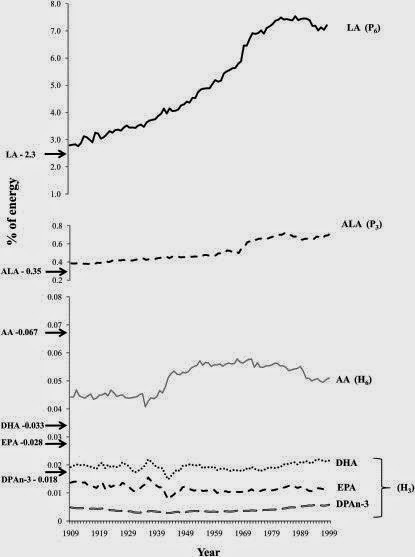 Benefit from SFA reduction (in events only) is only seen in studies that increased PUFA, and is not seen in studies published after 2000. The big 2000s study is WHI. Baseline PUFA in WHI was 7.8%E. Intervention reduced fat, but didn't go below 5%E PUFA. Whereas no doubt in a 60s trial baseline PUFA would have been near that 2.79%, and the interventions would have cleared the 5%. So we reach a state today where it would require very good compliance with an unusually restrictive diet to get "controls" like the controls in the 60's and 70's with regard to PUFAs; in fact, today it's lowering PUFA that has to be the "intervention".